Marlon Samuels (R) and Ben Stokes had clashed during the 2016 ICC World T20 final in Kolkata. England ODI captain Eoin Morgan has urged Ben Stokes to retain his competitive approach despite the prospect of facing longstanding antagonist Marlon Samuels in the first one-day international against West Indies. Tuesday’s match at Old Trafford is set to feature the latest chapter in the fiery relationship between Stokes and Samuels. West Indies batsman Samuels ‘saluted’ Stokes off the pitch in a Test in Grenada two years ago, a gesture that riled the England all-rounder. The pair then exchanged words during West Indies’ 2016 World Twenty20 final win over England in Kolkata -- a match where Samuels, who made 85 not out, was at the other end when Carlos Brathwaite hit four successive sixes off Stokes in the last over to give the Caribbean side the title. “I want Ben to be himself,” Morgan told reporters at Old Trafford on Monday. “I want Ben to get into the contest of a game. It’s part and parcel of his character and part and parcel of getting the best out of Ben Stokes. 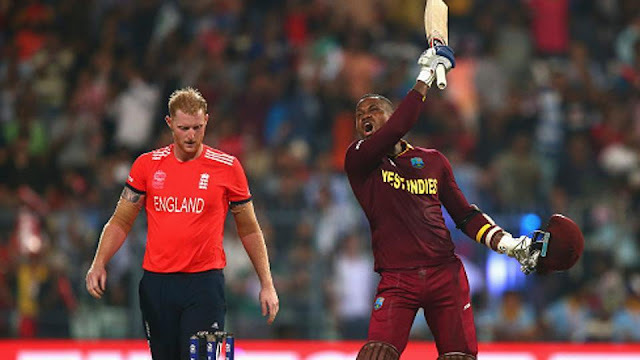 Following the World Twenty20 final, Samuels said Stokes was a “nervous lad”. “I’m going to come to England and be a good boy, at least for the start,” the 36-year-old Jamaican told the Guardian in an interview earlier this month. “As long as he (Stokes) keeps quiet, I won’t start anything,” Samuels added. Tuesday’s match has been given a extra twist by the knowledge Stokes is now just one demerit point away from a ban under the International Cricket Council’s code of conduct that could rule him out of two ODIs or one Test, whichever comes sooner. That has led to suggestions Stokes should get himself banned early during the West Indies one-dayers so he can start England’s upcoming Ashes Test series in Australia with a clean slate. Morgan added he hoped Stokes could transfer his red-ball bowling form into the ODI arena after the Durham paceman took a Test-best six for 22 in England’s series-clinching victory over West Indies at Lord’s this month. “He’s almost like having an out and out seam bowler, particularly after bowling like that at Lord’s. His confidence is quite high,” said Morgan. Meanwhile West Indies captain Jason Holder played down talk of another Samuels-Stokes flare-up, saying he hoped for a “smooth-sailing series”. Tuesday’s match will also be England’s first ODI since a crushing eight-wicket Champions Trophy semi-final defeat by eventual tournament winners Pakistan in Cardiff in June. Morgan, reflecting on the lessons learnt from that loss, said: “The most significant thing for us is to get the ball moving off the straight with the seam bowlers during that middle period when the ball gets a bit older. West Indies require a 5-0 series win -- or 4-0 with a tie or no-result -- over Morgan’s men if they are to gain direct entry to the 2019 World Cup in England. “It’s not going to be an easy task, but it’s not impossible,” said Holder. “That win in Durham from the T20 team has given the guys a boost.